Click below to order keyword-focused sales to rank your product in Amazon. We have ranked 500+ products in Amazon, generating millions in additional revenues for clients worldwide. Taking steps to encourage customer loyalty is one way to future proof your income and make sure your customer-base remains as strong as possible. The biggest thing most of us tend to consider when it comes to marketing costs is our ROI (Return of Investment). After all, if you try a new marketing technique but the orders and leads it creates don’t give you a satisfactory return on your investment, then the whole thing was pointless. As a result, many of us spend a lot of time trying to cut down our marketing costs and lower the price of every lead or conversion. This is great, but what about a way to drastically increase the amount of revenue brought in by one individual customer? If you pay £5 to attract a customer, and they spend £50, that’s maybe a fairly satisfactory ROI. But what if, for that same £5 cost, you could get that customer to keep coming back and spend £1000 over their lifetime? This is where customer loyalty and retention programs come in, and with a little research and hard work you can achieve exactly that sort of growth. Frequent buyer/user award programs are used to give loyalty benefits and extra incentives to convince existing customers to come back again and again. Read on for the definitive guide to eCommerce loyalty programs and how to use them to turbo charge your sales for little to no extra cost! Customers who return again and again are more valuable and more profitable to your business than customers who purchase from you once. That is the basic logic behind most online loyalty programs, and it’s pretty hard to argue with. “Customer loyalty“, also known as “customer retention” is the term used to measure how likely customers are to return to you and make another purchase. In a world of growing competition in the eCommerce sector, every customer you gain is a win. Your competitors will be doing everything they can to win those customers too, so you should be taking steps to persuade them to stay with you. A successful customer retention strategy can lead to heavily increased traffic, conversions and revenue with little to no increase in marketing costs. It can also lead to positive word of mouth and other benefits. An effective and attractive customer service strategy is a brilliant and crucial first step to tempting customers to come back to deal with you again. After all, up to 90% of customers have stopped dealing with a company after having a poor customer service experience with them. To get the best possible head start on this, check out our Ultimate Customer Service Guide for eCommerce in 2019. If you and your customers are happy with your customer service, but you still need to increase your customer retention (and who doesn’t? ), the next step is creating a loyalty program. Customer loyalty programs are a method used by a business in order to encourage repeat orders and increase customer retention. The most common method of doing this is to reward customers who make regular purchases, hoping to encourage brand loyalty. This has the added benefit of encouraging these customers to associate the name of your business with that type of product, removing the desire to look elsewhere. Loyalty programs originate from traditional retail. In the 1950s grocers began giving customers stamps for every purchase leading to discounts. Other famous loyalty program examples before eCommerce was around included Tesco Clubcards and Air Miles. 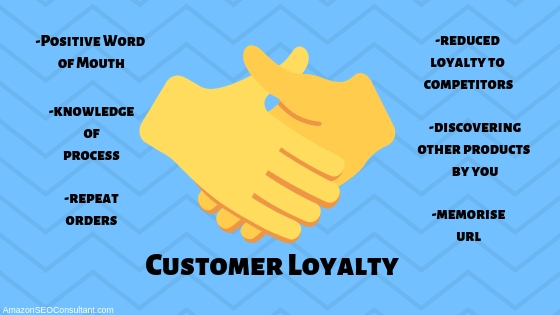 However, just like most aspects of business and commerce these days, loyalty programs rapidly spread to the internet during the explosive and continuing growth of eCommerce. They continue to change and evolve today to fit modern digital audiences, and 78% of consumers have said they prefer to access loyalty program rewards and incentives online and want them immediately. If you run an eCommerce business and are wondering how to improve your customer retention, now is the time to sit down and take notes! Companies often try and drive behavioural loyalty through the simple frequency programmes (FPs) that are designed to reward customers who buy frequently and in substantial amounts (for example, every fifth purchase is free), or through more complex loyalty/ membership programmes that have a much wider range of objectives according to different levels of membership. We’ve covered what they are, but how do you go about finding customer loyalty program ideas that can work for your business? This is probably the most common loyalty rewards programme and the first one you thought of when you saw this article. It’s also by far the easiest to implement. The basic way it works is when the customer makes a certain amount of qualified purchases, they receive a discount or a free item. 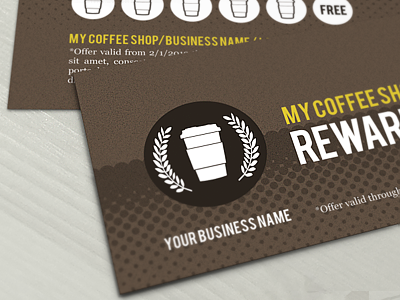 The simplest implementation is those loyalty cards in coffee shops where you get a stamp for every drink you buy, and once you get ten stamps, you get a free coffee. Very uncomplicated, and as easy as printing and handing out the cards, but the coffee shop just won a loyal customer that will likely continue visiting after the card runs out, and even ask for another card. The customer also got a free drink and feels valued for their repeat patronage. Can you say win win? These types of loyalty card programs are best suited for high-frequency, low-cost purchases such as groceries, coffee, sandwiches etc. This is for many reasons, not least that the free giveaway at the end isn’t going to hurt your business too much! Another reason is that it means the customer uses the card more often and is less likely to forget about it, which helps builds mind-share and habitual visits to your business. A loyalty points card for more expensive goods could just seem intimidating to the customer as they don’t want to ideally buy such items more than once. For example one for cars would probably be way less effective. Even though the average person buys many cars over their lifetime and this would likely provide you with a huge saving, if you’re dropping a large amount of money on a vehicle, the last thing you want to think about is coming back to the same place to do it again, no matter how far in the future that may be. Don’t forget, while retail stores use these physical cards, eCommerce businesses can track points in a customer’s account, use a rewards program app or even simulate an online loyalty card to achieve the exact same benefits. Simplicity is also a big factor here and the more complicated a points-based customer retention system is, the less likely a customer is to bother with it. A great example is Designer Shoe Warehouse. 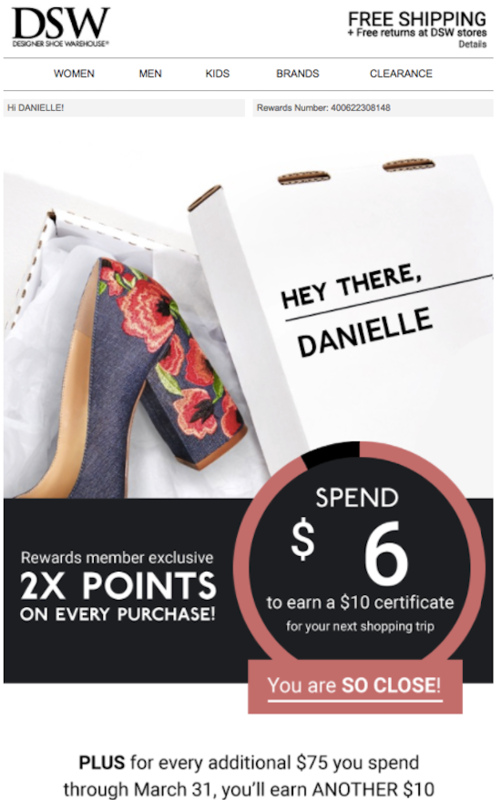 They reward each purchase with points that can lead to discount vouchers. However the website automatically tracks a customers points and continuously updates them on how much more they need to spend in order to get their next discount code. This means it’s as simple as possible without the customer having to do anything, but also has the additional benefit of giving the customer temptation to spend more after every order, just to get to that next saving. 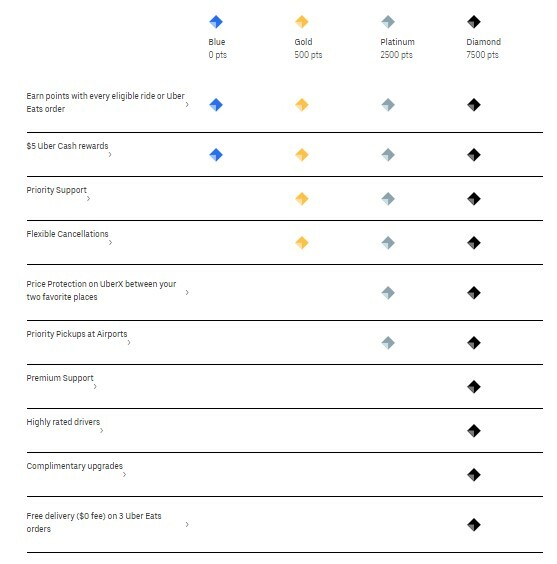 A tier-based customer rewards program is similar to the points system discussed above, but works off different tiers of customer. The more you buy the higher tier you reach, and each tier comes with bigger savings or other benefits. This is more often well suited to low-frequency, high-cost purchases such as luxury airline flights or high-class hotels. It is crucial you don’t make the tiers too difficult to achieve, or customers will just consider the program not to be of value to them, or even worse, to be a scam. This can have the opposite effect of the customer loyalty you’re looking for. However, when done correctly, tier-based loyalty schemes can increase customer spend and loyalty by a surprising amount. There is a social factor in play here known as “sociometric status” which explains for example why gamers love leaderboards or why motorists want to know if their car is faster or slower than their friends. Humans constantly evaluate themselves based on those around them, which can lead to customers desiring higher tier-status than their friends and bragging about it when they do. Online customer loyalty programs will do well to take notice of this and utilise it to create more engaging systems. There is even an element of gamification to it as climbing the tiers and watching their discounts grow can become very enjoyable and rewarding for the customer. You can play on this by adding progress bars and milestones to make it even more attractive. Paid loyalty programs are when you charge the customers for some form of premium membership that comes with benefits and exclusive content over the regular memberships. The most well known and successful example of a paid premium loyal customer program is probably Amazon Prime. 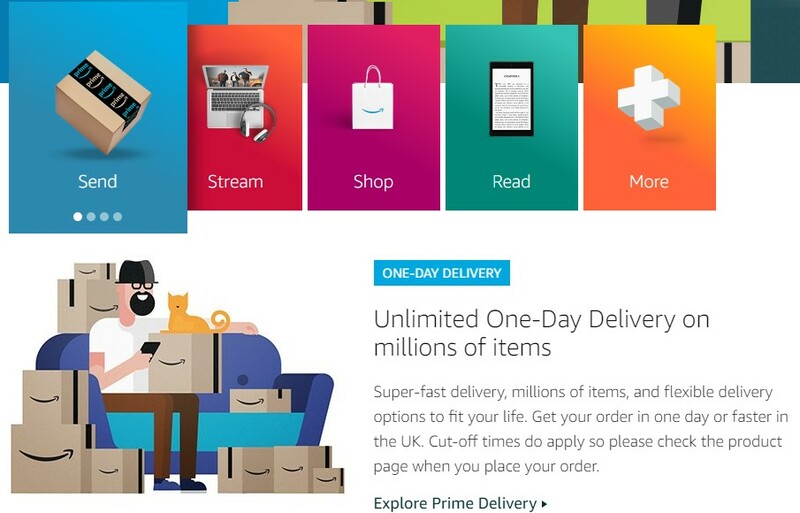 For an annual fee, Amazon Prime allows customers to get free expedited shipping on all orders and a range of other bonuses. BondInsights found that Millennials, Gen Z, and early tech adopters are much more likely to be willing to pay for enhanced benefits than anybody who has come before, so businesses targeting those groups can gain huge success from paid customer reward programs. Many customers see paying for a paid loyalty program to be an investment, and they’re happy to invest in it because they are sure they’ll see the return. This means increases in average order value, order frequency and general engagement as they chase the return on their investment. It’s also worth remembering that some people with more expendable income are often willing to pay for something just because it’s exclusive. To this type of customer, feeling like a VIP customer and receiving preferential treatment is more important than any actual discounts or savings you might offer them. And if you’re still not sure whether a paid customer rewards program can work, remember Amazon Prime hit 100 million subscribers last year, despite increasing its price from $99 to $119. That’s a lot of extra revenue and a lot of customers that are going to be coming back all year to take advantage of that investment. This one is a little different as you aren’t directly giving anything back to the customer. However, it can work very well for certain websites. For example, if you sell vegan products, you could donate a certain percentage of every order to protecting animal rights. This will give your customers a sense of accomplishment and feeling they are improving the world by buying from you. Since this is an issue they care about, they will likely always choose you over eCommerce competitors that don’t do the same thing. 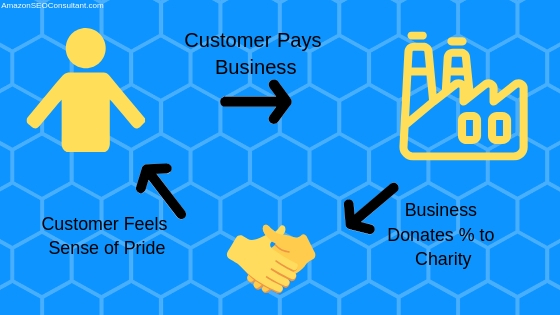 You can also combine this with a tier-based loyalty system, meaning the size of the donations increase if the customer spends a certain amount in a year. It’s as simple as offering online competitions, sweep-stakes and similar chances to win prizes. You should strategically plan the prizes to make sure they appeal strongly to the target audience or customer base you are trying to build. 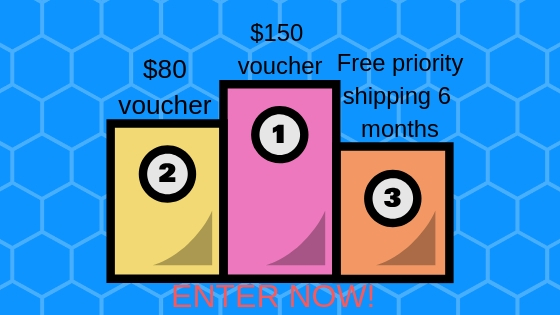 Once again, you can make use of some gamification here to make the contests more involving and give the user a sense of achievement, increasing their engagement with your brand as a whole. For smaller businesses or sole traders, it can be difficult to find the time and resources to implement a customer retention program. If you fall under this category, there are a range of companies and developers out there who can provide eCommerce loyalty software solutions and custom rewards programmes for you. 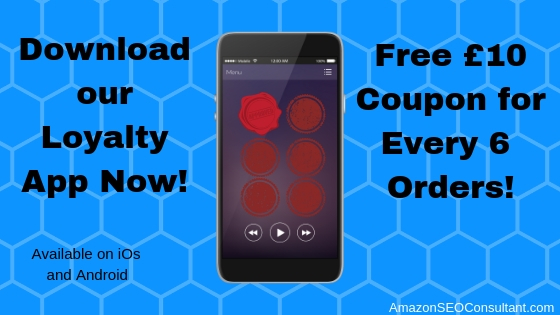 They are fairly low cost and easy to set up, and can work extremely well as long as you can convince enough people to download your customer loyalty app. The most important thing with these is not to place any barriers between the user and the app. It should be very easy or automatic to build points and receive rewards for the customer, and it should provide a wealth of analytics data and metrics for you. Web-based loyalty program software is also available meaning you can get all the metrics and analytics you need directly from your browser. Free customer rewards programs are also available which can be a huge benefit to sole traders and small businesses, but you do generally need to pay a subscription to get the best of all the features each solution offers. RewardCamp is a solid one that’s definitely worth checking out, and they can create a customised app for your brand that ties seamlessly into your website and buying processes. This is basically a hybrid loyalty program that uses features of more than one of the programs listed above. Considering the pros and cons of each program listed and piecing together something new that suits your brand can create something entirely unique and elevate your business to new heights. A simple example is the combination of donations and tier-based loyalty systems like we mentioned earlier, but more advanced versions could resemble Kiehl’s Rewards which offers point-based, tier-based and birthday bonuses, or even TopCashback, who is one of the best online reward programs despite not actually selling anything themselves. 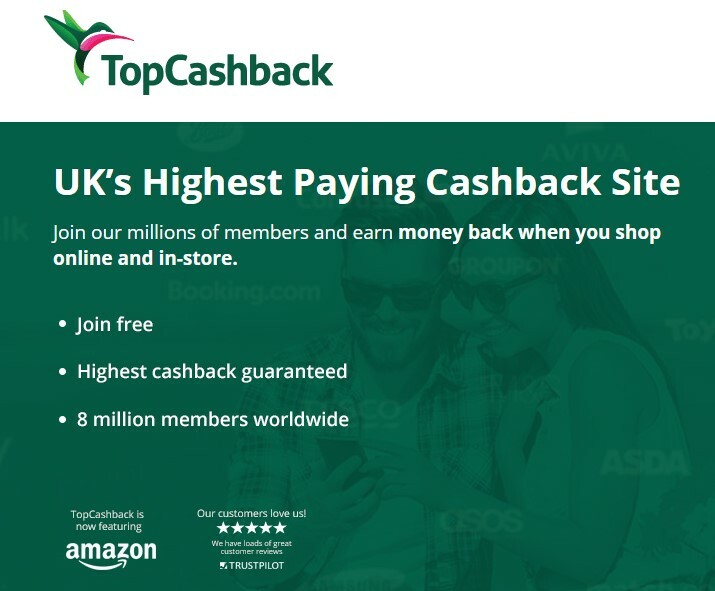 TopCashback offer rewards and cashback when you buy things online from anyone – essentially building a business model off of a loyalty program structure without even being an eCommerce site in the first place! The name of the program you devise to reward and encourage your loyal customers may seem to be the least important part of the plan. However, in many ways, it is one of the most important, since it will be the first thing your customers hear about your program. A simple tip is to give the program a catchy and unique name that feels exclusive and high-end. Can you see the theme there? This may be another seemingly simple tip, but the points in a reward system are rarely just called “points”. You may have heard of Clubcard points or Beauty Bucks however! Simple changes like this make the points themselves more appealing to your customers. When combined with a relevant, unique and catchy name, they can help form an emotional bond with your customers, which after all is the main thing we’re trying to do here. It is important to consider what benefits your reward scheme actually offers your customers, and whether they are appropriately attractive. 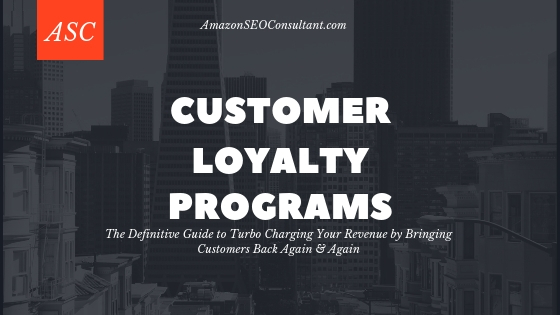 After all, if the rewards in your loyal customer program are not attractive enough, or are too difficult to obtain, customers will likely just ignore the scheme altogether, which is the same as if you never launched it in the first place. This is why the number one benefit to the customer of a successful loyalty scheme has to be rewards that are actually desirable. 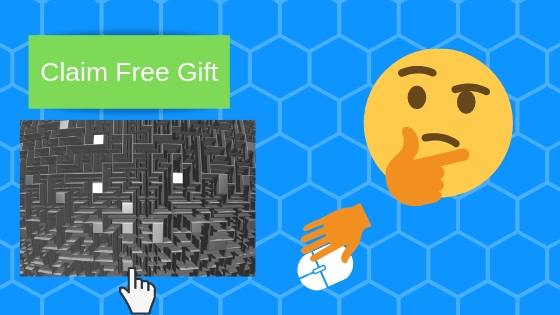 Discounts and free gifts can work, but they have to be the perfect items and can be less tempting to certain customers that aren’t directly interested in them. This is why a lot of customer loyalty solutions these days offer cash back that can be used anywhere – it’s very hard to turn down! You should do the appropriate research into your customers and their likes and dislikes to make sure you get this right. Of course, if you read our guide to Persona Marketing and set up customer personas when deciding who to target with your website, chances are you already know your customers very well and are aware of exactly what to offer. Your rewards should feel to the consumer like a free gift to thank them for their business. They shouldn’t have to put it any more work than making the purchase, and the reward should come to them. If a customer gets the vibe that accumulating their points or obtaining their rewards will be fiddly, they likely won’t bother. Keeping the benefits to the consumer in your mind at all times is an important thing to do because it makes sure you don’t lose sight of the basics of the loyalty program and making it as enjoyable and rewarding for the customer as possible, allowing it to complement your business. But what are the benefits for you? This one should be obvious by now but is the backbone of why loyalty/customer programs are so successful and important. Rewarding your customers for returning to you makes them feel valued and builds trust and preference for your brand. 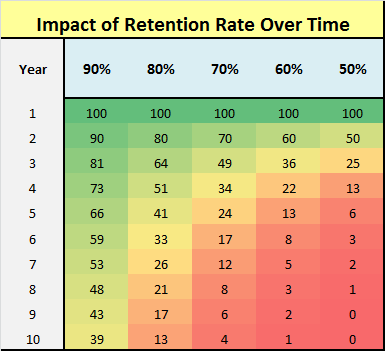 Increasing customer retention by as little as 5% can boost profits by anywhere from 25 to 95% due to the long term benefits of repeat business. Data analytics and keeping track of new and upcoming trends is always a major part of achieving eCommerce success. Loyalty programs give the business a complete picture of a customer’s buying habits, preferences and other behaviours. You can then use this data to inform your promotional activities, pricing and stock decisions. You could also take advantage of segmentation to tailor specific rewards and offerings to specific groups of your users. 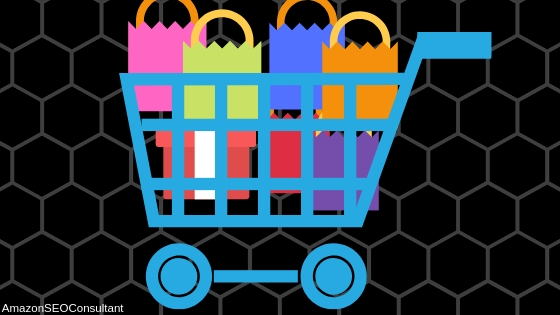 Data can also be used to cross-sell and suggest items a customer might be interested in. It can also be used for a variety of tactics such as selling a warranty to a customer after an initial purchase or offering extra discounts on related accessories. This detailed data can also be used to, for example, reduce prices in low demand seasons or increase it in times of expected high demand. Data segmentation also allows you to compare the buying habits of customers. This allows you to more consistently and generously reward regular buyers who spend higher amounts, minimising spend on customers who only buy low margin products. Over time this has the effect of driving up the average annual spend of your customer base. It’s time to take a look at some of the more famous and successful consumer loyalty programs and what aspects made them so impactful – the main theme running among these success stories is that they tend to create a unique proposal that appeals directly to the type of person that shops with them. If there’s one thing you take from this whole guide – make sure you do the same. 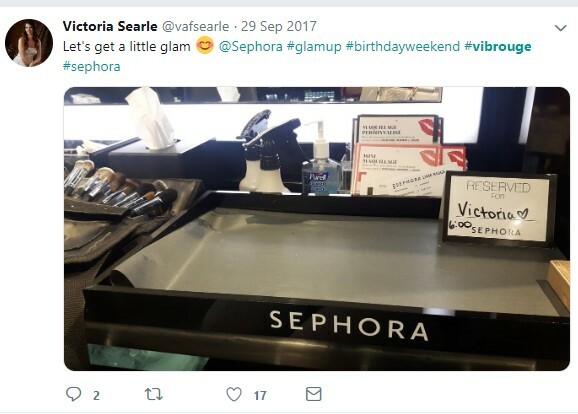 Sephora’s Beauty Insider Program is one of the most successful and well-realised loyalty program examples, so what exactly did they do so right? One major factor is the successful and effective use of a highly exclusive tier-based system. Tier-based systems work best when the amount of customers in the higher tiers is fairly low, making them feel like they have achieved something truly exclusive and special. 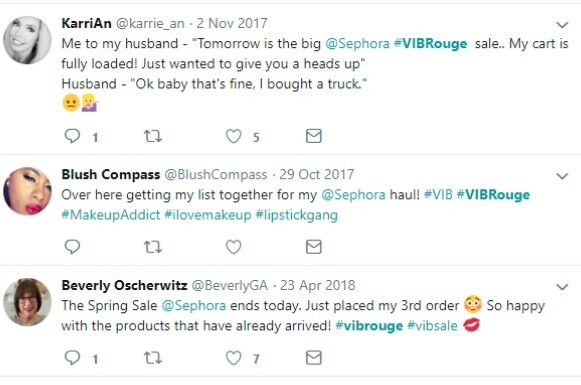 With an annual spend of $1000 required to reach the highest tier ‘VIB Rouge’, this tier seems to hit the sweet spot of being rare but obtainable. There are probably many customers who spend $1000 on makeup per year anyway but across a variety of websites and stores. 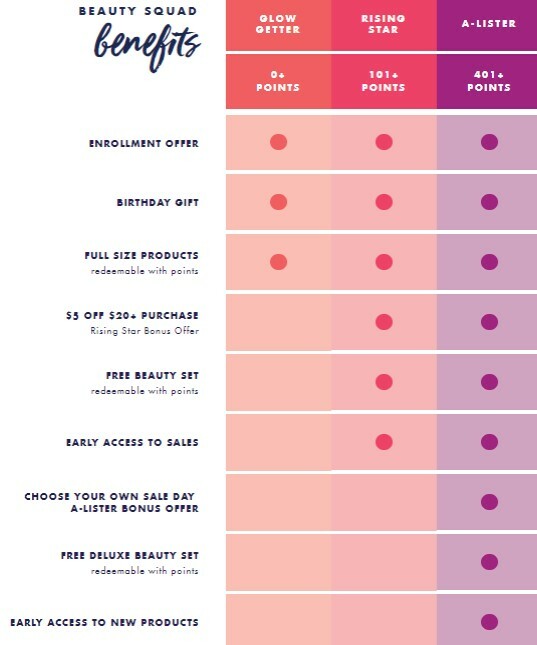 On seeing this tier they will be very tempted to make all their purchases from Sephora just to gain that top-level tier. At the end of the day, that’s the aim here, to remove the competition as an option. There is also an aspect of gamification here, but the biggest factor is how much effort Sephora has put into motivating each tier to work towards the next one, with an increasing sense of exclusivity and being appreciated. The added benefit of this is customers feel the need to show off and post on social media about their rewards and benefits in massive numbers. Which has the added benefit of selling the loyalty program to more people! Uber exploded onto the scene a few years ago, completely undercutting existing taxi services and running a reward-based referral program that saw their customer base grow rapidly. Now that’s how you make an impact on your chosen sector! They didn’t stop there, however, launching Uber Rewards soon after, and cementing another successful customer loyalty program for our list. This is arguably one of the best eCommerce customer loyalty programs, mainly due to how clear it is to understand. The rewards are based on a points system, offering you points for each Uber ride or Uber Eats food delivery. Once you get enough points, you get $5 off your next ride or delivery. However there is also a tier-based system, so as those points mount up, you get additional bonuses allowing you to get free cancellations, premium support, the highest rated drivers and more. This has the effect of making Uber a fixture in a customers life and makes it almost implausible for them to consider traditional taxi services. Business-to-business loyalty programs differ from business-to-consumer ones in strategy but not in intent. Some common examples include referral programs that reward your clients for suggesting your service to their contacts. Another highly influential example is one spearheaded by Castrol. They realised that motorists weren’t generally the ones deciding which motor oil to buy. The mechanics themselves would use whichever one they had or were used to buying. 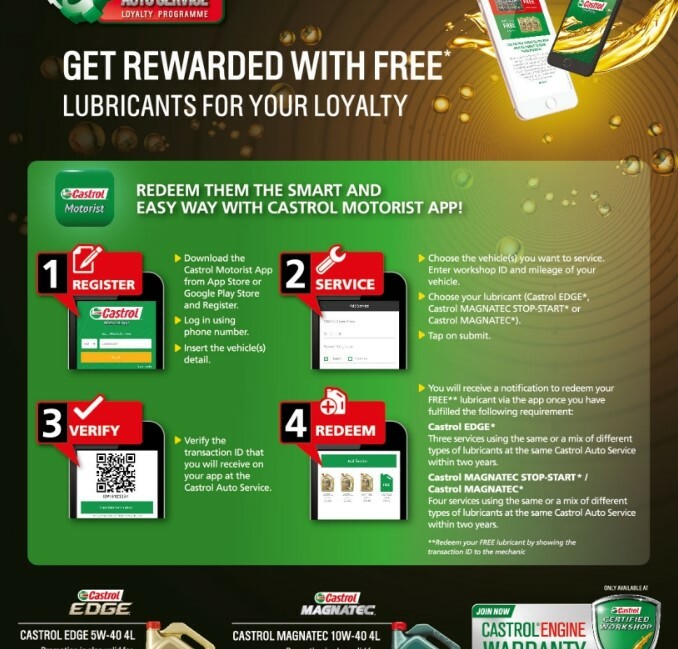 Castrol soon set up a B2B loyalty scheme that rewarded garages and mechanics with free oils and lubricants for sticking with Castrol. The result was a massive increase in customer retention and orders. Castrol also has loyalty based community sites that allow car and racing enthusiasts to communicate and work towards rewards together, which has a similar effect to Sephora’s program, convincing customers to increase their standing just to feel superior to their peers. 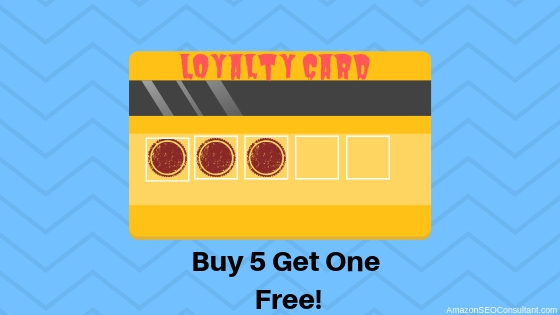 For larger businesses with development capabilities, creating your own custom loyalty program is the best way to keep it unique, focus on conversions and allow for constant changes and development in the future. If you’re looking into how to create a loyalty program but custom development is not an option for you, there a variety of loyalty program software packages out there that already offer highly customised rewards programs with quick deployment. Some great options for businesses in this situation include RewardCamp and Fielo. These are strong solutions when it comes to loyalty rewards programs for small businesses with limited resources, because they allow you to completely automate your loyalty programs, and refinements and updates come directly from the developers, freeing you up to work on whatever you need to. Now you are pretty well-versed on eCommerce loyalty programs, let’s take a look at a few final details that will help you with customer retention and increase your overall margins. Customer feedback is the simplest and most direct way to learn what customers enjoy about your website, and what the sticking points may be. Listening to both the happy and the unhappy customers, and putting those survey results to work means a constantly improving user experience, which can only help with retention. Customers are also more likely to return if they complain about something and see changes made, as it makes them feel valued. For more information about user experience, conversion rates and the conversion funnel, check out our advanced guide to eCommerce Conversion Rates in 2019. You might think you’re doing the best you can with your customer service strategy, but without some sort of tracking and KPIs, you can’t actually know that. KPIs enable you to improve your customer service strategies over time and satisfy customers queries at an increasing percentage. For more information on customer service and how it can improve customer spend and retention, we highly recommend going through our in-depth Ultimate Guide to Customer Service. Social media lets you interact with and market to your customers right in their daily lives. You need to pay attention to their posts and which of your products they’re discussing as well as addressing any regular criticisms you may find. Another strong social media plan is to identify your most vocal fans and engage them as potential influencers. Offering them increased value and benefits in return for self-identifying as an advocate or ambassador of your brand can have huge results for a very minimal up-front cost. So there we have it for loyalty programs! Keep an eye on AmazonSEOConsultant for more advanced eCommerce guides on a day-to-day basis, and don’t forget to check out our Case Studies page to see how we can provide a rapid and unmatched ranking to the first page for almost any product on Amazon, boosting your profits and allowed you to focus on other things! Tom Buckland is the founder of Amazon SEO Consultant & HQ SEO – An organic marketing agency helping businesses grow through the Amazon channel. Sign up free to find out the 7 secret strategies we use to explode sales & drastically improve organic rankings. Copyright © 2019 Amazon SEO Consultant. All rights reserved.